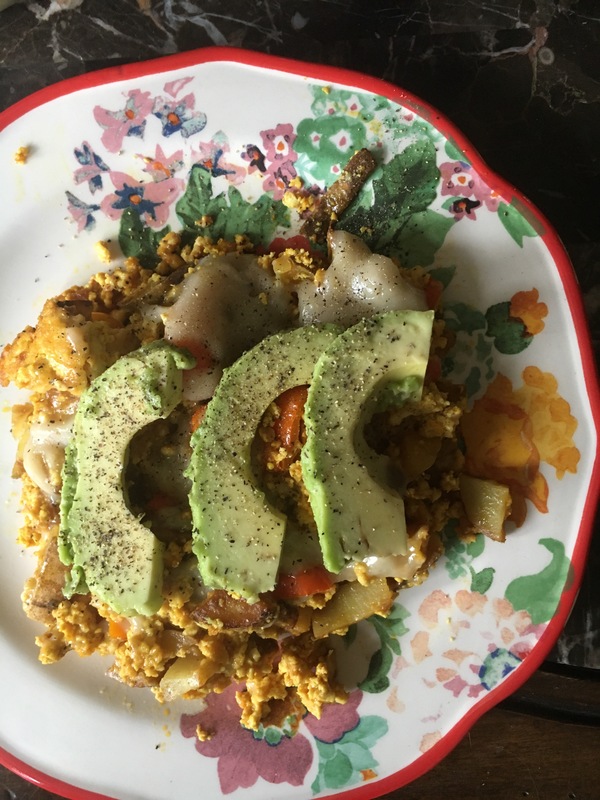 I absolutely love making and eating tofu scrambles. My love affair began when I first ordered the plant-eating panhandler at Heartland Cafe. I was absolutely amazed how flavorful it was and honestly how much better it tasted than eggs. Even my sister, who eats eggs, loves it and whenever she is in Chicago we have to go to Heartland cafe for their tofu scramble. This tofu scramble is a great protein packed way to start your day. This first thing you will want to do it press your tofu to get most of the moisture out. Get a cutting board and layer it with paper towels or a dish cloth, put the tofu on the towels, layer more towels, and then top with a heavy book. Press for 30 minutes. You can also check to see if you need to replace the paper towels, chances are you will because they will be soaked with moisture. While the tofu is pressing, cut the potatoes into small pieces and put them into a sautee pan with a drizzle of olive oil on medium/low heat. Season with a pinch of salt and a few dashes of garlic powder. The potatoes will take around 20 minutes to cook depending on how small the pieces are. You will know the potatoes are done when you can easily stick a fork in them. When the potatoes are almost done cooking, add the bell pepper to the pan and cook for another 10 minutes. Add another small pinch of salt. Now put the pressed tofu in the food processor and pulse until the tofu is crumbled. Make sure not to pulse too long, otherwise you will end up with a tofu cream. Add the tofu to the sautee pan along with the nutritional yeast, a pinch of salt, a pinch of pepper, turmeric, paprika, garlic powder, and hot sauce. If you like things really spicy, go to town on the hot sauce. If you would rather have a more mild scramble add only a couple dashes. You can always add more later. Stir the scramble and watch the egg yellow color develop from the turmeric. I cook mine for about 8 minutes, and stir every minute or so. It always amazes me how much tofu can look like eggs! Now slice your vegan cheese of choice ( I really loved the daiya jalapeno havarti), layer on your scramble, cover, and lower the heat to the lowest it can go. Let this sit for about 5-10 minutes so the cheese can have a chance to melt. While you are waiting for your cheese(or gary as some people like to call it) to melt, slice your avocado. Now all you have to do is anxiously wait for the cheese to melt so you can get this scramble on your plate and into your belly! Once the cheese it melted, dish it out, top with avocado and a sprinkle of pepper, and devour. No, those are not eggs, and no that is not real cheese. Could have fooled me!